then you can define the source for the members' data here. The list of user objects that are currently members of the group is shown here. Opens a dialog where the user objects can be selected. Deletes the currently selected user object. Users can be read dynamically from data fields that contain user GUIDs or IDs here. Select the corresponding data field here. Members can also come from other applications. Select the application, data group and data field whose values should be used. The same applies for this setting as well, the data field must contain the users' GUIDs and IDs. 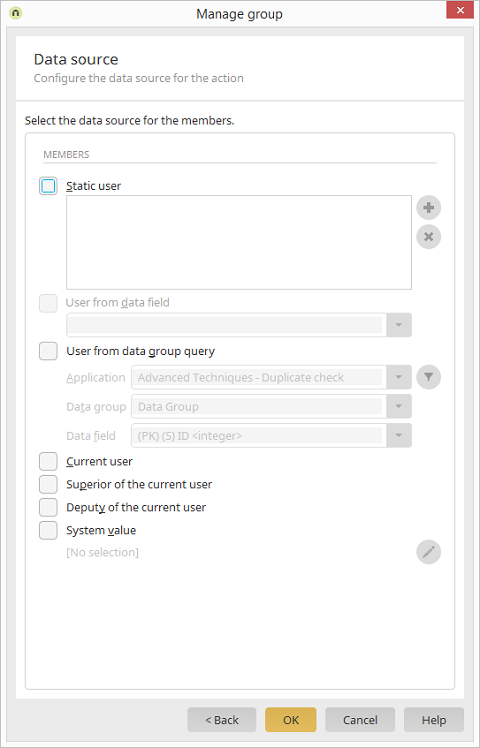 This setting means that the currently logged in user is seen as a member of the group. Equally, the Superior or Deputy of the current user can be used. With this setting, a system value can be defined that provides the members. The system value must therefore provide the corresponding user GUIDs and IDs. Opens a dialog where the system value can be configured. 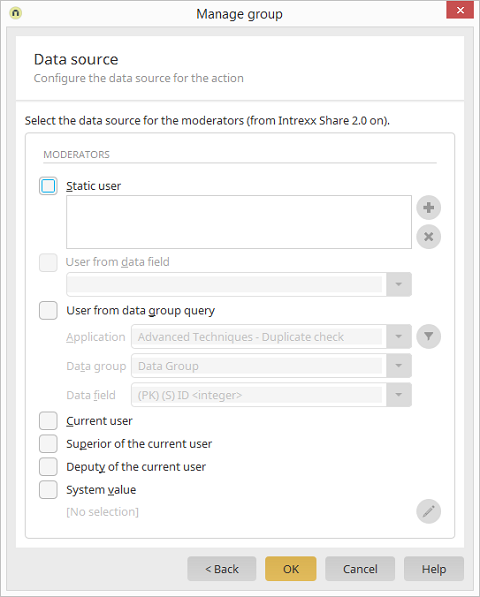 If, in the previous step, you selected the option "Replace moderator by exactly one moderator", the data source for this moderator can be defined here. The current user will be entered as the moderator with this option. A specific user can be defined as the moderator here. Opens a dialog where the user can be selected. The user can be read dynamically from data fields that contain user GUIDs or IDs here. Select the corresponding data field here. With this setting, a system value can be defined that provides the moderator. The system value must therefore provide the corresponding user GUIDs and IDs. 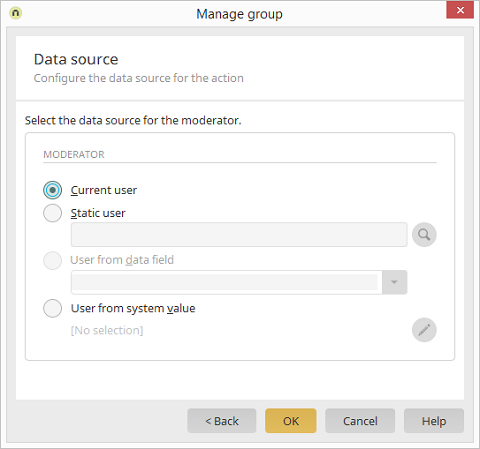 If, in the previous step, you selected the option "Replace moderator with any number of moderators" or "Keep previous moderators, add new ones", the data source for these moderators can be defined here. Specific users can be defined as the moderators here. Moderators can also come from other applications. This setting means that the currently logged in user is seen as the moderator. Equally, the Superior or Deputy of the current user can be used. With this setting, a system value can be defined that provides the moderators. The system value must therefore provide the corresponding user GUIDs and IDs.